Electric guitar design is a type of industrial design where the looks and efficiency of the shape as well as the acoustical aspects of the guitar are important factors. In the past many guitars have been designed with all kinds of odd shapes as well as very practical and convenient solutions to improve the usability of the object. George Beauchamp invented the electric guitar or some may call the lap steel guitar. Initially, electric guitars consisted primarily of hollow archtop acoustic guitar bodies to which electromagnetic transducers had been attached. 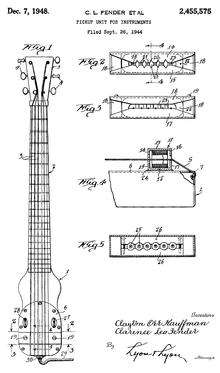 Sketch of Rickenbacker "frying pan" lap steel guitar from 1934 patent application. Electric guitars were originally designed by an assortment of luthiers, electronics enthusiasts, and instrument manufacturers, in varying combinations. Some of the earliest electric guitars, then essentially adapted hollow bodied acoustic instruments, used tungsten pickups and were manufactured in the 1930s by Rickenbacker. In 1935, a Soviet scientist working separately from his western colleagues was known to have produced an electric Russian guitar called the "Kuznetsov electromagnetic guitar". It was exhibited at a technology expo in Moscow, but its development was halted since the Stalin regime was hostile to guitar music. At least one company, Audiovox, built and may have offered an electric solid-body as early as 1932. Audiovox electric guitars were built by Paul Tutmarc who is also credited as the co-inventor of the magnetic pickup along with Art Stimpson, and the fretted electric bass guitar. Bob Wisner worked for Paul converting tube radio amplifiers into guitar amplifiers and eventually developing his own amplifier circuits so Paul's instruments could be sold along with their own amplifiers. Paul was unsuccessful at obtaining a patent for his magnetic pickup as it was too similar to the telephone microphone coil sensor device. Audiovox production was handed over to Paul's son, Bud Tutmarc, who continued building these instruments under the brand, "Bud-Electro" until the early 1950s. Bud Tutmarc had been delegated by the senior Tutmarc the task of winding the pickup coils used on his father's and he continued producing them for his own guitars. He used horseshoe magnets in a single-coil and later a hum cancelling dual coil configuration. Bob Wisner was hired by Rickenbacher, later spelled Rickenbacker and may have passed on Tutmarc's magnetic pickup technology and helped them develop the more familiar bar magnet and pole-piece pickup construction still widely used today for their cast aluminum electric guitar, nicknamed The Frying Pan or The Pancake Guitar, beginning in 1933. Another early solid body electric guitar was designed and built by musician and inventor Les Paul in the early 1940s, working after hours in the Epiphone Guitar factory. His log guitar (so called because it consisted of a simple 4x4 wood post with a neck attached to it and homemade pickups and hardware, with two detachable Swedish hollow body halves attached to the sides for appearance only) was patented and is often considered to be the first of its kind, although it shares nothing in design or hardware with the solid body "Les Paul" model sold by Gibson. Sketch of Fender lap steel guitar from 1944 patent application. In 1950 and 1951, electronics and instrument amplifier maker Leo Fender through his company, designed the first commercially successful solid-body electric guitar with a single magnetic pickup, which was initially named the "Esquire". The two-pickup version of the Esquire was called the "Broadcaster". The bolt-on neck was consistent with Leo Fender's belief that the instrument design should be modular to allow cost-effective and consistent manufacture and assembly, as well as simple repair or replacement. In 1954, Fender introduced the Fender Stratocaster, or "Strat". It was positioned as a deluxe model and offered various product improvements and innovations over the Telecaster. These innovations included an ash or alder double-cutaway body design for badge assembly with an integrated vibrato mechanism (called a synchronized tremolo by Fender, thus beginning a confusion of the terms that still continues), three single-coil pickups, and body comfort contours. Leo Fender is also credited with developing the first commercially successful electric bass called the Fender Precision Bass, introduced in 1951. The first design was an Early Telecaster model, called Squier, with a single mic. The main contribution Leo Fender did, was the bode and neck removal separetly. In previous models, when the guitar need repairs, the complete instrument needed to be sent, while, after Leo fender design, the plate could be unscrew and sent to the shop only the damaged part. Gibson, like many guitar manufacturers, had long offered semi-acoustic guitars with pickups, and previously rejected Les Paul and his "log" electric in the 1940s. In apparent response to the Telecaster, Gibson introduced the first Gibson Les Paul solid body guitar in 1952 (although Les Paul was actually brought in only towards the end of the design process for expert fine tuning of the nearly complete design and for marketing endorsement ). Features of the Les Paul include a solid mahogany body with a carved maple top (much like a violin and earlier Gibson archtop hollow body electric guitars) and contrasting edge binding, two single-coil "soapbar" pickups, a 24¾" scale mahogany neck with a more traditional glued-in "set" neck joint, binding on the edges of the fretboard, and a tilt-back headstock with three machine heads (tuners) to a side. The earliest models had a combination bridge and trapeze-tailpiece design that was in fact designed by Les Paul himself, but was largely disliked and discontinued after the first year. Gibson then developed the Tune-o-matic bridge and separate stop tailpiece, an adjustable non-vibrato design that has endured. By 1957, Gibson had made the final major change to the Les Paul as we know it today - the humbucking pickup, or humbucker. The humbucker, invented by Seth Lover, was a dual-coil pickup which featured two windings connected out of phase and reverse-wound, in order to cancel the 60-cycle hum associated with single-coil pickups; as a byproduct, however, it also produces a distinctive, more "mellow" tone which appeals to many guitarists. The more traditionally designed and styled Gibson solid-body instruments were a contrast to Leo Fender's modular designs, with the most notable differentiator being the method of neck attachment and the scale of the neck (Gibson-24.75", Fender-25.5"). Each design has its own merits. To this day, the basic design of many solid-body electric guitar available today are derived from the original designs - the Telecaster, Stratocaster and the Les Paul. In 1962 Vox introduced the pentagonal Phantom guitar, originally made in England but soon after made by EKO of Italy. It was followed a year later by the teardrop-shaped Mark VI, the prototype of which was used by Brian Jones of The Rolling Stones. Vox guitars also experimented with onboard effects and electronics. The Teardrop won a prize for its design. In the mid 1960s, as the sound of electric 12 string guitar became popular, Vox introduced the Phantom XII and Mark XII electric 12 string guitars. Vox produced many more traditional 6 and 12 string electric guitars in both England and Italy. It may be noted that the Phantom guitar shape was quite similar to that of first fretted electric bass guitar, the Audiovox "Electric Bass Fiddle" of 1934. In 1966 Vox introduced the revolutionary but problematic GuitarOrgan, a Phantom VI guitar with internal organ electronics. The instrument's trigger mechanism required a specially-wired plectrum that completed circuit connections to each fret, resulting in a very wide and unwieldy neck. John Lennon was given one in a bid to secure an endorsement, though this never panned out. According to Up-Tight: the Velvet Underground Story, Brian Jones of the Rolling Stones also tried one; when asked by the Velvets if it "worked", his answer was negative. The instrument never became popular, but it was a precursor to the modern guitar synthesizer. In recent years, guitars and basses with multi-scale or fanned-fret fingerboards started to emerge, as manufactured by Novax Guitars, Ormsby Guitars and others. These instruments are supposed to offer an advantage over the classical fixed-scale guitars and basses by providing more freedom in setting the tension of each string at the design and manufacturing phases. This may result in a more uniform tension of the strings, as well as possibly offer timbre and tonal characteristics somewhat different from the usual fixed-scale instruments. Also other materials than wood were used. Travis Bean as well as Kramer built guitars with aluminium necks. Danelectro used masonite bodies. Also plastic and carbon bodied guitars have been made in the past. The Gittler guitar was a design guitar made in the 80s. 1991 saw the introduction of guitar designer Jol Dantzig's first truly workable acoustic-electric hybrid guitar design. The instrument, called the DuoTone, was conceived while Dantzig was at Hamer Guitars. (Dantzig was also the designer of the first 12 string bass.) Adapted by players like Ty Tabor, Stone Gossard, Elvis Costello and Jeff Tweedy, the DuoTone was a full "duplex" instrument that could switch between acoustic and electric tones. Recently there have been many entries in the hybrid category (capable of both acoustic and electric tones) including the T5 by Taylor, Michael Kelly's "Hybrid," the Parker Fly and the Anderson Crowdster. In the 90s the band Neptune began building weird looking metal guitar with 3rd bridge options incorporated. A predecessor of this type of guitars is the Pencilina. Linda Manzer designed the Pikasso guitar with multiple necks. ↑ Bud Tutmarc's remarks concerning his father's role in developing the first magnetic pickup for a guitar and the first fretted electric bass guitar.